Nathaniel Eugene Burleson (born August 19, 1981) is a former American football wide receiver. He played college football for the Nevada Wolf Pack and was drafted into the National Football League (NFL) by the Minnesota Vikings in the third round of the 2003 NFL Draft. He is currently a color commentator for the Detroit Lions on the Detroit Lions Television Network. Burleson was also been a member of the Seattle Seahawks, Detroit Lions and Cleveland Browns. He is the son of former CFL and USFL player Alvin Burleson, and the younger brother of former National Basketball Association player Kevin Burleson. Burleson was born in Calgary, Alberta, Canada. At the time his father, Alvin Burleson, was playing defensive back for the Calgary Stampeders of the Canadian Football League (CFL). He was born into a prolific and tight-knit sporting family. His oldest brother, Alvin Jr., played college football for the University of Washington Huskies and the Western Illinois University Leathernecks. Another older brother, Kevin played professional basketball and was formerly a point guard for the Charlotte Bobcats of the National Basketball Association (NBA). His younger brother Lyndale played college basketball for the University of Nevada Wolf Pack. Kevin and Nate Burleson are one of only two sibling duos in which one brother played in the NBA while the other played in the NFL. As a mark of his father's influence, Nate Burleson's jersey number on the Seattle Seahawks, 81, was his father's high school number. In 1983, when Burleson was an infant, his father signed with the Los Angeles Express of the United States Football League (USFL), moving the family back to the United States. However, Burleson remains proud of his Canadian heritage, sporting a maple leaf tattoo and expressing interest in playing for Canada in a World Cup of football to the media. After an injury ended Alvin Burleson's playing career, he moved the family to his hometown of Seattle, Washington, U.S., where he worked for Associated Grocers. Nate Burleson attended Rainier View Elementary School in Seattle. He attended Lindbergh High School in the suburb of Renton as a freshman, and then transferred to O'Dea High School in Seattle, where he graduated. As a senior, he was named Seattle Times City Athlete of the Year. Burleson was also on the school's track and field team, competing as a sprinter and hurdler. He won the state title in the 300-meter hurdles with a time of 38.70 seconds in 1999, and finished eighth in 110-meter hurdles as junior. Burleson hoped to attend the University of Washington, his father's alma mater, but was not offered a football scholarship. Instead he accepted a scholarship offer from the University of Nevada, Reno and played for the Nevada Wolf Pack. In the 2002 season he made 138 receptions, the second highest in NCAA history. His senior year he led the NCAA in both receiving yards and in receptions per game. During his time at Nevada he made a total of 248 receptions for a total of 3,293 yards and 22 touchdowns. He was named first-team All-America by the American Football Coaches Association, All-WAC by the Western Athletic Conference (WAC), and team MVP, and was named second-team All-America by The Sporting News and CNN/SI. He currently holds the WAC and Nevada all-time records for single game receptions with 19 catches. He graduated with a degree in human development and family studies. Burleson was selected in the third round of the 2003 NFL Draft by the Minnesota Vikings, the 71st overall pick. He showed promise during his rookie season, but did not put up great numbers. In his second season, 2004, Burleson emerged as a threat when fellow receiver Randy Moss injured his hamstring. Burleson was now the go-to-guy for Minnesota. He put up strong numbers and reached 1,000 receiving yards for the first time in his career. Not only a great receiver, but a standout special teams player as well, Burleson is the only player in NFL history to have three punt returns of 90 or more yards. 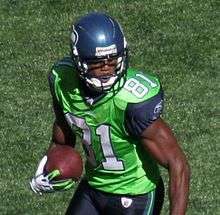 Burleson with the Seahawks in 2009. On March 24, 2006, Burleson signed a seven-year $49 million offer sheet to play with his hometown Seattle Seahawks. In retribution for the Vikings signing an offer sheet with former Seahawks guard Steve Hutchinson, the Seahawks put clauses in Burleson's offer sheet which made it virtually impossible for Minnesota to match (similar to what the Vikings did with Hutchinson). The offer sheet stated that the entire $49 million would be guaranteed if Burleson played five games, in one season, in the state of Minnesota, or if his average per year exceeded the average of all running backs on the team combined. The Vikings played eight home games a year in Minneapolis, and at the time of the offer sheet, the team spent far less than $7 million per year for its entire running back corps. On the other hand, Seattle was spending over $7 million a year on just one of its running backs (Shaun Alexander). The Vikings had seven days to match the offer sheet but declined to do so. Minnesota received Seattle's third-round pick in the 2006 NFL Draft; Seattle, however, received no compensation for the departure of Hutchinson. On September 7, 2008, Burleson tore a ligament in his knee in Seattle's season opener against the Bills. He was put on injured reserve for the remainder of the season. During the early hours of the NFL free agency period on March 5, 2010, Burleson agreed to a five-year $25 million contract with the Detroit Lions. Burleson reunited with his former offensive coordinator, Scott Linehan, with whom he had his best season of his career in 2004, when he caught 68 passes for 1,006 yards and nine touchdowns while playing for the Vikings. In 2011, Burleson was named recipient of the Detroit Lions-Detroit Sports Broadcasters Association/Pro Football Writers Association's Media-Friendly "Good Guy Award" for his interactions with the media in Detroit. On September 24, 2013, Burleson fractured his forearm in two places in an early morning, single-car accident. It was reported that Burleson was attempting to save a pizza from falling off a seat in his car and lost control of his vehicle. He was cut from the Lions on February 13, 2014. On April 6, 2014, Burleson signed a one-year deal with the Cleveland Browns, but was cut on August 30. In 2015, it was announced that Burleson would join the Detroit Lions broadcast team as a color commentator for the Detroit Lions Television Network. He is also an analyst for the NFL Network, where he currently co-hosts "Good Morning Football". Burleson's wife is named Atoya. Together they have three children: two sons and a daughter. Burleson was sponsored by DiGiorno after a car accident in which he lost control of his car to save a pizza. 1 2 3 4 Raley, Dan (September 13, 2006). "Burlesons are the first family of Seattle sports". Seattle Post-Intelligencer. Retrieved October 19, 2010. 1 2 Duff, Bob (October 18, 2010). "Lions' Burleson proud of Canadian roots". Montreal Gazette. Retrieved October 19, 2010. ↑ Fryer, Alex (June 21, 2007). "Rainier View remembered". Seattle Times. Retrieved June 21, 2007. ↑ Spratt, Gerry (December 9, 2011). "Nate Burleson wants you to know where he went to elementary school". Seattle Post-Intelligencer. Retrieved December 9, 2011. ↑ "Source: Receiver Nate Burleson agrees to 5-year, $25 million with $11 million guaranteed deal with Detroit Lions - ESPN". ESPN. Retrieved March 6, 2010. ↑ Rosenthal, Gregg (February 13, 2014). "Nate Burleson released by Detroit Lions". NFL.com. Retrieved 2014-07-08. ↑ "Nate Burleson, Cleveland Browns strike one-year deal". NFL. Retrieved April 6, 2014. ↑ "Nate Burleson cut by Cleveland Browns". ESPN.com. August 30, 2014. Retrieved August 30, 2014. 1 2 "Nate Burleson Stats". ESPN Internet Ventures. Retrieved 11 April 2014. ↑ "Burleson, Rubick, Shepard make up Lions Preseason broadcast team for Fox Sports. In 2016 Burleson joined the cast of "Good Morning Football" on the NFL network. Detroit". NFL.com. July 30, 2015. Retrieved July 30, 2015. Wikimedia Commons has media related to Nate Burleson.